I was looking for a coat pattern for my friend AuntieE. 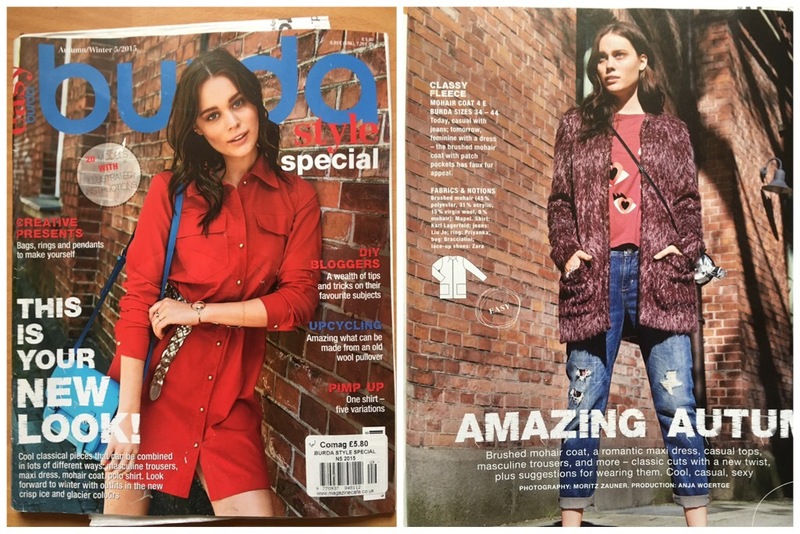 We chose this one from an old Burda Style mag Autumn/Winter 2015. We got the fabric on our recent trip to Goldhawk Road. I think it was AtoZ Fabrics. I don’t think it’s pure wool, it wasn’t expensive enough. But it has a lovely soft bouncy feel. It looks felted or fulled. I need to remember to ask more questions about the fabric I’m buying, clearly! AuntieE was thrilled; it was “My navy” so it HAD to be the one! She liked the pattern, but wanted the neck wider, so I shortened the shoulder by 3cm from the neckline. 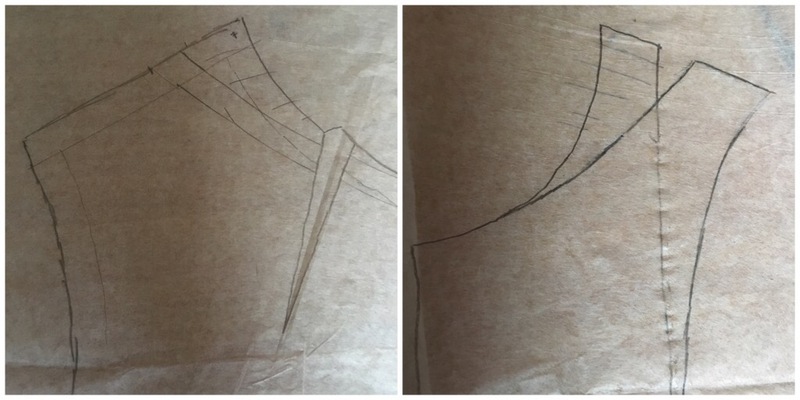 I folded the dart into the paper and drew a new curve for the front and back neck. Using my Swedish Tracing Paper I could easily lay the facings over the new pattern pieces and re draw them to match. 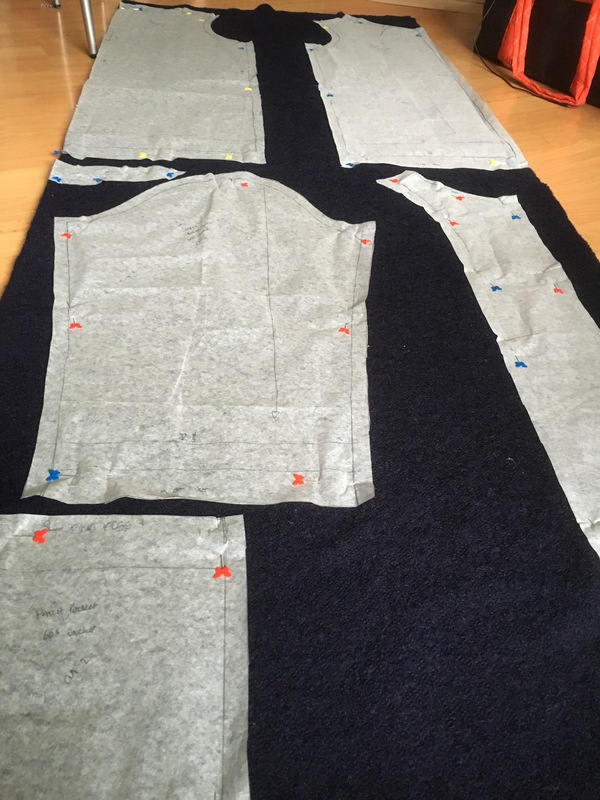 Every pattern brings a new challenge (one of the things I love most about sewing) and although every challenge seems different, I’m slowly learning how to adapt what I’ve discovered previously and apply it to a new project. I’m so new to sewing that most of what I end up doing is for the first time. This blog helps me to remember what I’ve learnt. 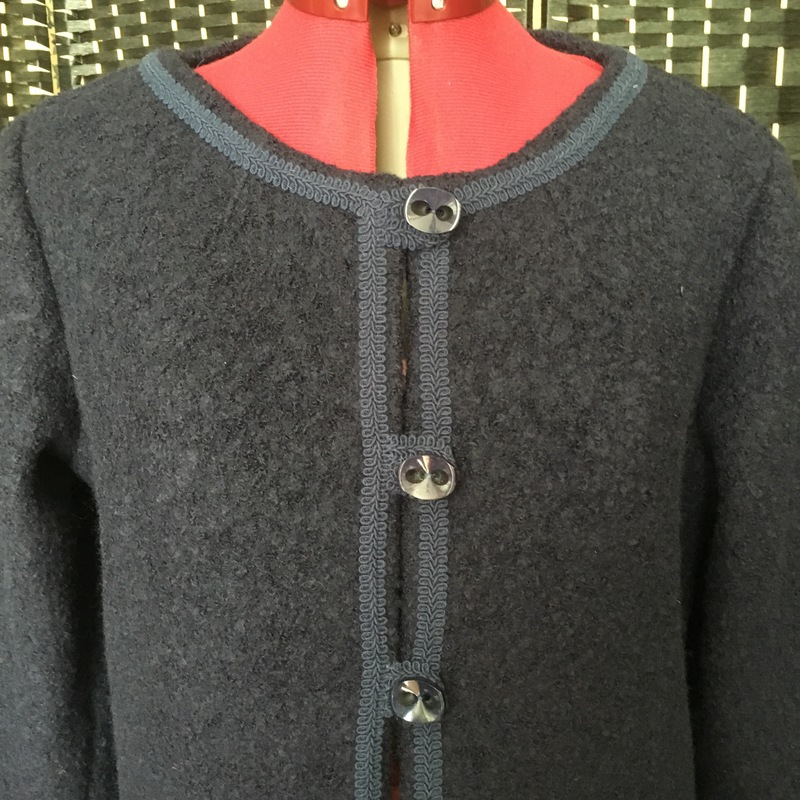 I was halfway through this alteration when I realised I had added seam allowances to the front and back but not the facings. Often, I’m concentrating so hard on the main task that the ‘little’ things which would be obvious to an experienced sewer can really trip me up! … One day I’ll get there! It’s time to clear the decks in my tiny little flat… Cutting-out time! 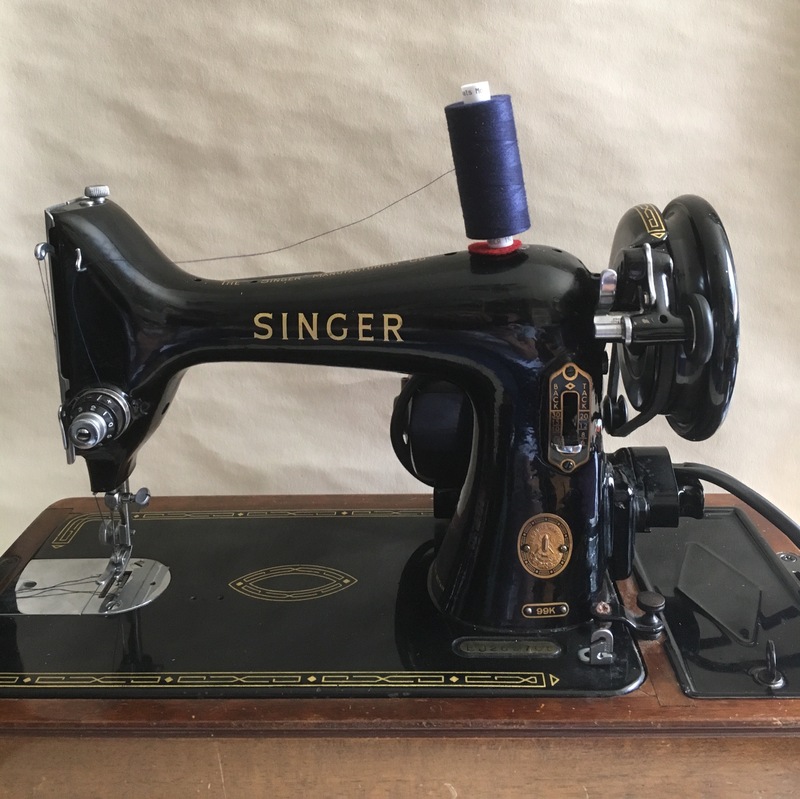 Recently I’ve read a few blogs on old sewing machines, and I’ve managed to get my mums old Singer 99K running smoothly (maybe I’ll blog about that another time, it was fun). 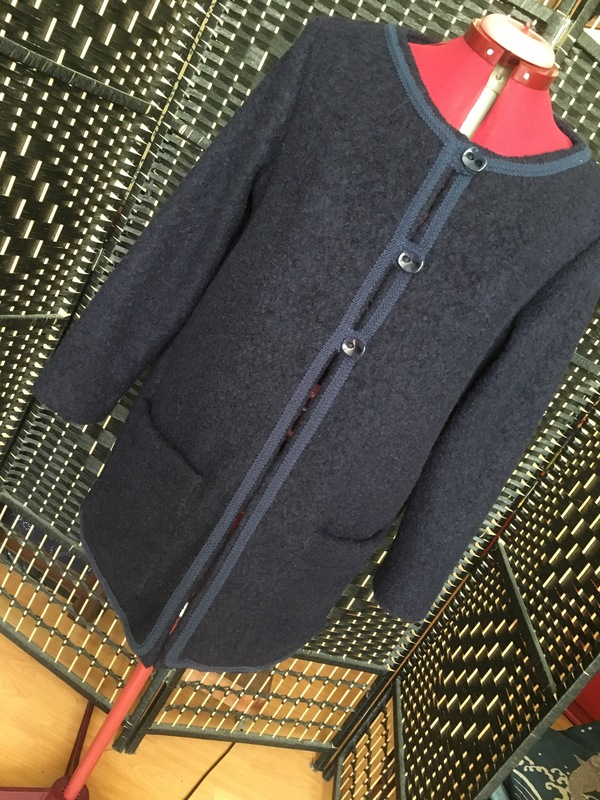 I’d already decided I was going to bind the seams with fabric left over from the dressing gown I made for AuntieE, so with no need of a zigzag stitch, I made my mind up to sew this up on the old singer. I’d used it before, I made my first shirt on it two years ago. Now it was running more smoothly (& I’d got the backstitch function working!) so I was excited rather than daunted. I’ve not used any kind of stay tape etc on shoulder seams before. I had this tape left over from a pair of MrA’s work trousers. I’m not sure I did it properly but it seems to be doing its job. I topstiched it down to cover the raw edges. Above shows the insides and the outside. It all went together very nicely. 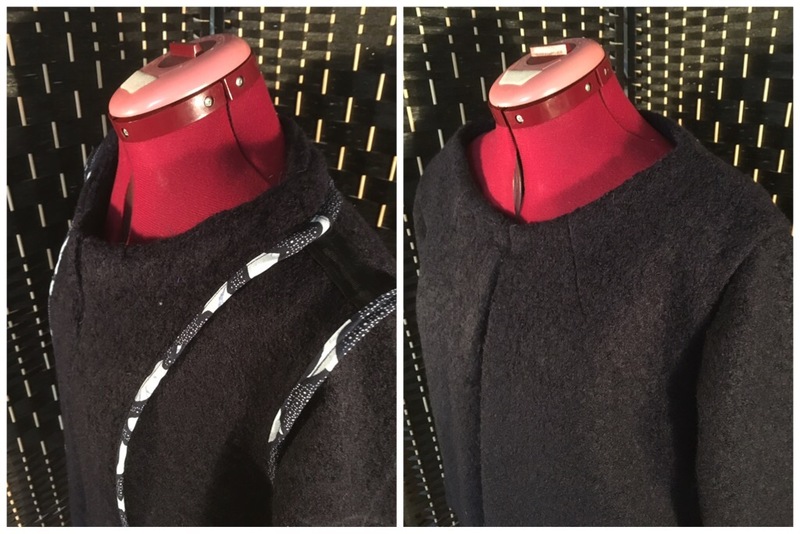 The bounce of the fabric made the easing over the top of the sleeve much easier than cotton! 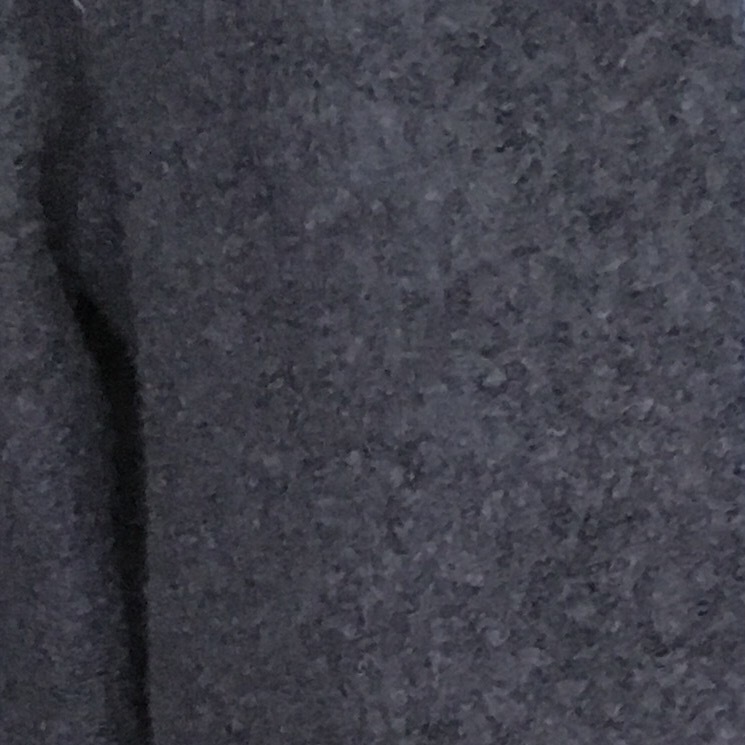 I didn’t set the sleeves in, I sewed them in flat, before the side seams. I’m a bit scared of setting in sleeves, but I think this would have been a safe fabric to do it on. Oh well, next time. 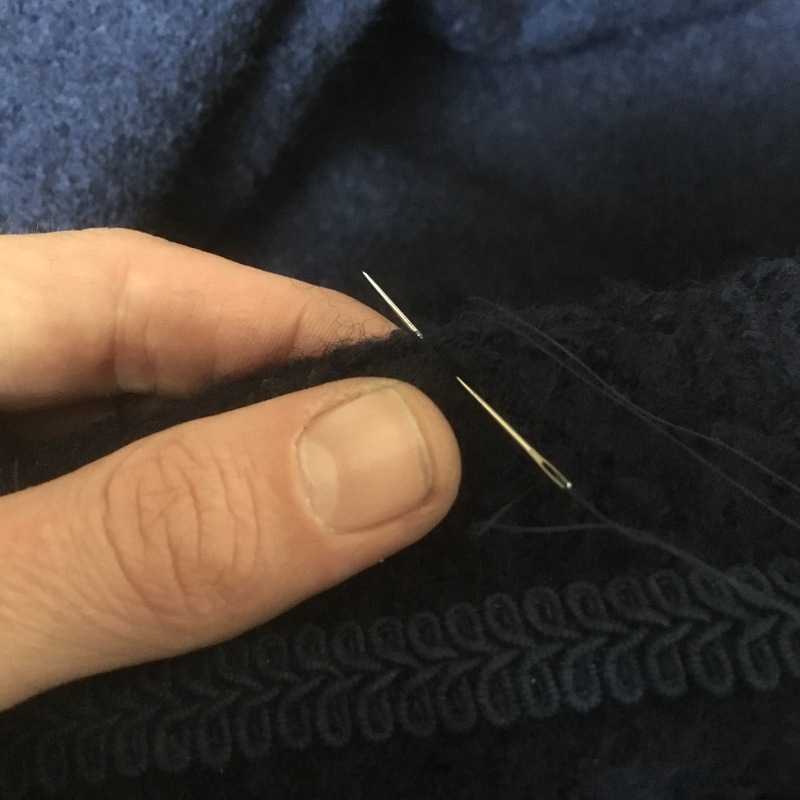 I wasn’t as thorough perhaps as I could have been attaching the pockets first time round… Imagine the scene, 11pm, sporting my miners headlamp, I snip my final thread, place my hand proudly into my first hand sewn pocket… And … my fingers poke out through the gappy-stitching! I seem to have created ‘built-in-fingerless-gloves’! I could have tried convincing myself (& you, dear reader!) that the first go round was ‘basting’ – I definitely will baste rather than just pinning next time this comes up, but for now, I had to admit it was just shoddy workmanship, so the following night I donned my miners helmet and I did it again. Properly! With the pockets and trim, I really got into hand sewing. The fact that I had no deadline meant that (once I’d figured out how to do it effectively) I could take my time, over a few evenings, and actually start to take pride in the slow and steady working of hand stitches. I made some loops out of the tiny bit of trim I had left and got down to some more hand stitching. I’m really happy with the way it came out. And, thankfully, so is AuntieE! So there it is, my first ladies jacket. Thanks for reading. Happy sewing! 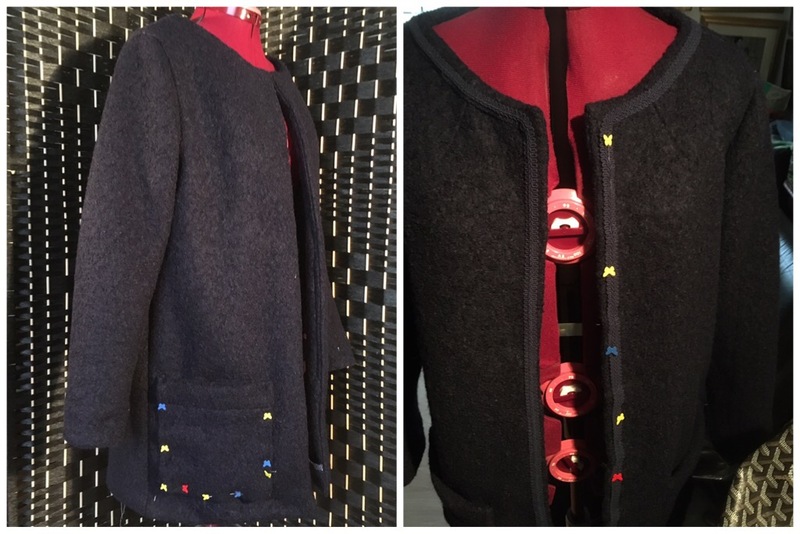 There is no quick hand sewing. Relax & enjoy it. 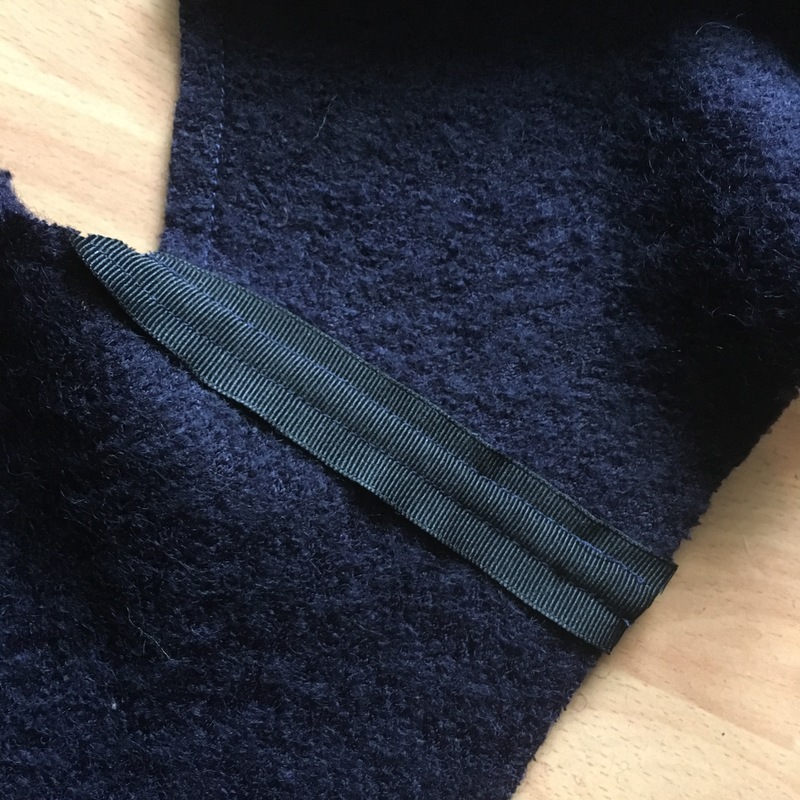 Always take seam allowance off before adapting a pattern. Clean your nails before taking close up pictures! 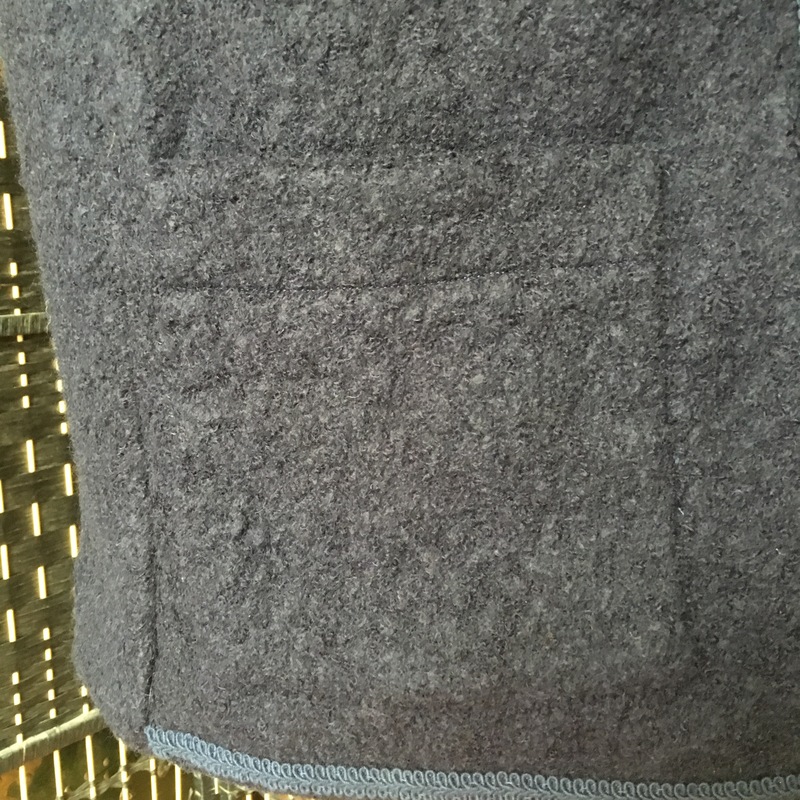 Previous Previous post: Wax Print – Full Chicken Pocket!